The Protea’s are in England with the first of 4 Test matches beginning on the 10th of July. A 20/20 match and an ODI series will follow the Test series. The last time SA toured England Graeme Smith had just begun captaining his country and started with a blaze, scoring two double centuries in the opening two tests, including a SA record 277. SA’s strong start faded and they lost the final test, drawing the series. Smith is now wiser as a captain and has a more balanced and settled team and will look to claim SA’s first series win in England since readmission. South African legend Shaun Pollock, currently playing for Durham in the T20 in England will be part of the Sky commentary team for the SA/England tour and will be called upon by the Protea’s for advice and help in the nets. Jeremy Snape, the former England player, who retired from first class cricket on Tuesday, has joined the Protea’s coaching staff as a performance coach. Snape performed the same role for England during last years T20 World Cup and for the Rajasthan Royals in this years IPL. 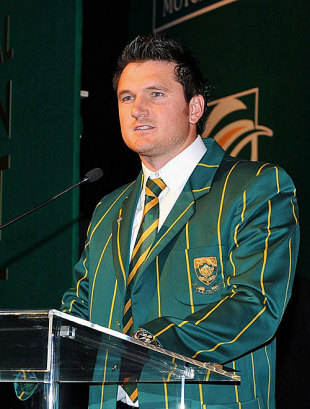 Protea captain Graeme Smith was part of the Royals team and was said to be very impressed with Snape in his role. Andre Nel has left the Titans to join the Lions. Nel spent 4 seasons with the Titans. His move is said to be for personal reasons. Turkey battled well and can be proud of their effort, last night and throughout the competition, but it is Germany who will meet the winners of tonight’s match, Spain and Russia, on Sunday for the crown. Spain have been many peoples favourites for the title, in terms of quality in personal, and it terms of form, with the added bonus that they play entertaining football, but Russia must rank as the surprise team of this years competition. While four years ago there is no doubt that Greece were the surprise package, winning the tournament, there will be pleasant smiles that this time the dark hourses who have come good have not employed negative tactics to get their results. Alot can happen in a few weeks, and this is the case with Russia. They aren’t the same team that was dismantled easily by Spain in their opening group game, losing 4-1 to a David Villa hat trick inspired Spain. Tonight Spain will come up against a well trained unit who will not be overcome by the occasion, who will each know what their role for the team is and will do there best to perform that role. Andrei Arshavin has been the catalystfor the change to Russia’s fortunes. He was suspended for the opening 2 games, but since his return Russia have been the form team of the competition, along with Spain. They way they made Holland, the best team until then, look like an school side at times bares testament to that. Russia pride and self belief puts them up with the Germans, in terms of the whole being greater then the individual. They will have no doubts that they can get past Spain and Germany. Doing it will be harder though. Spain will look to go better then both Portugal and Holland, who both looked great for 3 matches but then lost the most important one. The only unbeaten team left they will have to remain so to win tonight and on Sunday, with no time left for a bad day, as Russia had against them, and Germany did against Croatia. The Spanish have a feel that this is their year and with Villa scoring the goals, Cassilas making the saves, and a host of midfield talent to choose from, they could very well be right. The Russians will come at the Spanish more than any team has yet done. There defense will be under threat as it has not been thus far, and Villa and Torres will have to make sure they take the chances that come their way. Spain will have learned a lot from their game against Italy and will look to carry that know how, that feeling that they can compete in tight situations as well as flowing open games, into this game. Russia will be no push overs and will look to avenge their big loss in the opening round. Arshavin and Villa have been the stars and with both seeming likely to be moving on after this week the world will be watching and keeping tabs and these two in particular. Their dream moves could be made or lost tonight. This could be the rare competition that sees both semi finals crammed with goals. Lets hope so. The semi finals are upon on now with Germany and Turkey going to battle tonight and Spain and Russia meeting tomorrow night. With both Portugal and Holland bowing out at the first knockout round the torch for entertaining play took a major hit. It’s now down to just Spain from the predicted list, but looking at how Russia tore apart Holland, they could be worthy torch bearers come Sunday evening. First up are the Germans and the Turks. The German machine has proved to be the most reliable in big tournaments, especially when it comes to knock out matches, and so they proved yet again this year. Portugal looked a class act in the group games and should have been heavily fancied to win this year, yet they came up shorter than the 3-2 scoreline suggests against a dominant Germany, focused purely on the prize on Sunday and on nothing else. A concern for Germany will be the misfiring of Mario Gomes, but so long as those around him, Podolski, Klose and Ballack are banging in the goals, they need not worry. Gomes will come right and tonight would be the time for that. Turkey, amazingly, have led for a total of 9 minutes in all their matches thus far. Thats 9 minutes in 4 games. A remarkable statistic that best illustrates their never say die attitude. They play until the final whistle is heard, until the very end, and don’t give up until then. They have not lost a competitive match against Germany since 1984 and will relish the underdog tag that has followed them for almost all their games. They are down to the bare bones due to injury and suspension, but it would be the fool who counts them out just yet. And Germany are no fools. Turkey must feel like they have their name written on the trophy, that it is destiny and fate that is pulling them towards Sunday evening. Getting past the Germans will be the true test for any believer. The Germans should be to strong for the Turks, but we said that of the Czechs and the Croats, so this one is too close to call. Should the Turks get through this tie it would be hard to argue against them deserving the title for their spirit alone. Cricket South Africa has implemented changes in the national teams selection policy, following on from the chaos that ensued from the last few teams selections, culminating in Charl Langevelds international retirement. The whole mess began with Norman Arendse deciding that the cricket team was too white and vetoing the selection of the team to tour Bangladesh. The team was given its stamp of approval by Gerald Majola behind Arendse’s back and the fiasco was to repeat itself over the coming months. During the tour of India the squad was announced for the long series against England, and this time Arendse got his way, with Langeveld selected and Nel dropped, bringing the squad into line with the transformation policy Arendse was determined to force through, to the harm of the game and the country. The new selection policy has removed the veto rights of Arendse, ensuring there would not be any repeats of the last few months. What it has also done is take coach Arthur and captain Smith out of the selection panel. They will both be consulted but have no selection power. Smith will be responsible for decisions made on the field and not off it. Which is how it should be. The removal of Arsendse’s veto power is a move in the right direction for the sport and the political interference within it. No one should be able to forcibly push their own agenda through. Another aspect to come out of the discussion was the recommendation that a “black African” be part of the selection panel. So no longer is non white black but rather they have qualified the term as needing to be “black African.” This may be a step in the wrong direction. Firstly it suggests that white, Indian and coloured selectors may not be choosing black African players. This is not true and evening the suggestion takes us a step in the wrong direction. Secondly, while we all know that transformation is important, and that a representative team would be ideal, it must be done so naturally, and not forced. By qualifying black as being African it pushes coloured and Indian players down a notch on the transformation “rating.” Coloured and Indians also suffered under apartheid and should be equal to black Africans (and whites but in terms of transformation black should mean non white). In the end the new selection policy is a case of one step forward and one step back. We are no nearer where we should be than we already were. But at least Arsendse does not have the veto and wont be playing with players careers anymore. With Euro 2008 about to reach its knock out stage, the business end of the tournament, the most pleasing aspect of the two weeks of matches thus far has been the progress of Holland and Spain. Their performance has been a triumph for football, as much as Euro 2006 was a dark period in recent international competitions. While the title can never be taken away from Greece, they won it ahead of much better teams and should rightly be pleased with that moment of history, it was still a blight of a tournament that bored rather than entertained. At that stage, at the end of a long season, the Greeks managed to bore the world better than the rest of the field. Blame it on whatever you like, tired legs, the fact that the Greeks were mile fresher then any other team, luck, good for the Greeks, bad for everyone else, history will still tell you that in 2006 Greece won the European Championships. And that’s all it will say. There will be no side not about the way they played, or rather the way they didn’t. So it has always been. This would have been the excuse needed by all in sundry to put out the same stall as the Greeks, and make sure that results are all that matter. 2006 was a tournament that saw teams put out predominately 4-5-1 formations and look to wear the opponents down, get a goal, put everyone behind the ball, and hold out for the win, creating little and using very little imagination or artistry. The Greeks weren’t the only ones to do this, they just managed to do it well at this time. This was the way football was headed, with results become of far more importance than entertainment. Today in England Arsenal and Manchester United are commended for their attacking, flowing, entertaining play. Yet only United have married this with winning. Arsenal must be given credit for continuing with this philosophy despite the lack of trophies. They will continue with it for as long as Wenger is in charge and so lets hope that that is for a long time to come. They could easily adopt the style, or lack of it, of Chelsea and Liverpool, the other two forces of the “Big Four” in England. Liverpool play with one up front, pack the midfield, and launch balls up to the terrific pace of Torres. Chelsea say they play a 4-3-3 and on paper it is exactly that. But on the field, where it matters, they play a 4-5-1. They have been successful with it and so have persisted with it. Abramovich wants fantasy football, like United, Arsenal and Barcelona play, but both Mourinho and Grant brought dull but effective football to the Bridge, winning was more important than putting on a show. Abramovich will be hoping Scolari shares his vision but must be aware that there is a lot of pressure on a manager who spends 100 million a season, pressure to make sure he wins, and this will become more important than how he wins. Will he be happy with a season where his team play the best football in the world, as Arsenal have at times, yet finish with nothing? I doubt that. And so we come back to Euro 08. Spain and Holland have played football the way it should be played and, with Spain to complete their group matches tonight, have both topped their groups and thus far have both got 100% records. Holland have counter attacked with a true 4-3-3 formation, not Chelsea’s false one, with pace and drive down the flanks, and Ruud in the middle. Spain have done what so many in international and club football have forgotten to do – play with two up front. With Villa and Torres up front you always know that if you create chances they will be put away – and so they have been. International football was headed into the dark ages but has been rescued by Holland and Spain this year. It would only be right if one of these two teams were to take home the trophy in 10 days time and show the world you don’t have to be dull to win. Football is about passion and entertainment. Let them entertain. Miguel Veloso, the Sporting Lisbon midfielder currently with the Portugal squad at Euro 08, has long been touted as being Premiership bound, with Manchester United seemingly favourites to land the talented central player, and Arsenal, Chelsea, Spurs, Newcastle and even Everton ready to pounce. 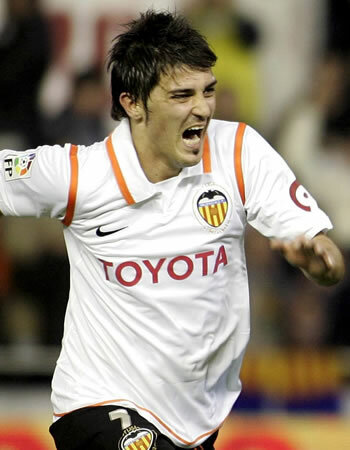 It now seems he may be heading to Italy to join AC Milan. While a host of club scouts are no doubt waiting to see Veloso in action at Euro 08 before making their move Milan may have jumped the line by taking action. The link to Milan is not new but where as before it was coming out of Veloso’s camp, and denied by Milan, they have now revealed that Veloso could be a Milan player in the future. Milan director Ariedo Braida has said that the club are interested in Veloso and he could see him being a Milan player in the future. While this does open the door to a move to Italy it does put a vague spin on the time scale. He hasn’t said that they will be moving for Veloso this transfer window but merely that he sees him at Milan in the future. With the Milan squad an aging one, and any new signings tending to be for the future, as a new Milan is born, with the likes of Pato leading the way, Veloso would fit the mould of the type of midfielder MIlan would want, probably taking over from Gattuso in the middle of the park. However with a host of clubs monitoring the situation anyone interested in Veloso will have to make a move soon, and would have to meet Sportings valuation of the player, which wont be cheap. For now he is still a Spoting player, but it is only a matter of time before he makes the move to one of Europes elite. When doing my preview posts for Euro 2008 I suggested that Holland may struggle to get through the group of death, mainly because I didn’t have much faith in their defense, and couldn’t see them getting past world champions Italy, and World Cup finalists France. I even felt that Romania, who I thought would be a surprise package, could pip them, as they did in qualifying, as leave the Dutch in last place. After two rounds of games not only have the Dutch qualified for the quarter finals and won the group, with a game to spare, but along with Spain and Portugal, look like the team to beat. While I do maintain that the Dutch defense is not the strongest, and has yet to be really tested, their brand of counter attacking football has been phenomenal, and the scores of 3-0 and 4-1 against Italy and France, the World Cup finalists, have born this out. They make full use of their strengths and have played, tactically, the perfect game, considering their line ups. The speed at which they move the ball, from defense, to the back of their opponents net, has been amazing. Robin van Persies goal against France is perhaps the best example of this and surmises exactly what the Dutch are aiming for. While their defense may not be the best, with Edwin van der Saar organising things at the back, and proving to be as safe as always, they have not been tested. The van der Saar effect is something that Manchester United have found since he arrived, with a good defense becoming a great defense. His calmness, composure, and positioning, added with his still great reflexes and shot stopping, have brought the best out of the defense, who know there is another wall behind them to be breached. Any team that can bring on the likes of Robben and van Persie off the bench has to be stacked with attacking talent. They have both been used with great affect to kill off the opposition, as was shown against France. With Sneijder and van der Vaart pulling the strings in midfield, van Nistelrooy leading the line superbly, and de Jong and Engelaar keeping things tight in the middle, the Dutch have soaked up their opposition, and counter attacking with speed and effectiveness. The team effort has been rewarded with results and acclaim. When we get into the knock out stages, and should the Dutch come up against Spain or Portugal, we could have the game of the tournament, with attacking play and substance rewarding the fans with goals. The Dutch defense will surely be tested then, as will their composure and belief, but for now the Dutch have certainly been the best team on show, and have drawn a marker as the team to beat. The Dutch could be on their way to only their second major international honour, putting them up there with the 1988 Euro Champs winning team of Gullit, Rijkaard and current coach Marco van Basten. You are currently browsing the My Sports Blog blog archives for June, 2008.